Here is our Class 1A Regional Final preview capsules, along with predictions from Joe Pinkos and FloridaHSFootball.com. Skinny: There is a lot of playoff tradition between both of these small Class 1A programs and they will meet again on the field for the straight year in the playoffs. Both of these teams go way back, being in the same district for many years prior to the formation of the rural Class 1A. This year both teams won their respective districts and first round games easily. Baker has been feeling pretty confident about what they have as a team this season, while Graceville has played seemingly well when they need to, but at times have come up short in games that could have been winnable. Baker has been balanced on the offense this season while reducing the amount of points given up this season, while Graceville tends to get into high school affairs. That could spell trouble more for Graceville than it does Baker and thus why Baker could be an almost go-to pick to get to Orlando next month. Skinny: West Gadsden has only been to the regional finals one other time – that was in 2008. However, if people take a look at the deep roots of West Gadsden High School, they go back to the pre-2006 consolidation of Chattahoochee and Greensboro High Schools. The latter of the two schools were more successful when it came to football when Greensboro won the Class A state championship in 1975 and had a deep run in 2000. With Blountstown, the tradition of fielding successful football teams goes back over many decades and there is no doubt now the Tigers are trying to get back to a place they got to in 2013 where they fell just short of their first state championship since 1977. For Blountstown keep an eye on QB Bryson Horne who has thrown for nearly 1,500 yards, while the Tigers mix it up on the ground game with a variety of backs to keep things balanced. On the West Gadsden side of things keep an eye on QB Dentarrius Yon, who is only a junior. He has thrown for nearly 3,000 yards this season, which is the most by a quarterback in Class 1A and has a couple of targets he can throw to make things miserable for any team. Skinny: A rematch of a second-round playoff game last season and the fourth meeting of the teams over the same number of seasons, this will be a big matchup of the ages for both teams that are just in their second year of being in Class 1A. Now take a closer look at the scores of the previous three meetings and you will find that the scores have been pretty close and that is a good indicator of how well coached both Madison County and Fort White are under Mike Coe and Demetric Jackson respectively. For Madison County, they know what the drill is here in this one. Win this game and you move on to the state semifinals. For Fort White, the Indians have never been to the state semifinals, something that would change with a win. For the Cowboys keep an eye on RB Treyon Henderson who is their big ball carrier and has already rushed for over 1,300 yards. Keep an eye on ATH Demetric Jackson Jr. who is a big weapon for the Indians and can play both ways. Skinny: What is believed to be the first-ever meeting between both teams, there is something special about this matchup for all of Class 1A. Take the defending state champion in Trenton and pair them up with one of the prior powerhouse teams of the 2000’s in Pahokee that has been on a comeback and you have a battle for the ages. For Bill Wiles’ squad this about going into in a tough environment and being able to come out a winner, something that Trenton has been able to do over the last six years now. However, Anquan Boldin Stadium is no Boot Hill and that is the biggest difference in the environments right there. The people of western Palm Beach County care about their football and they will turn out like no other when one of their teams is still alive in the playoffs. For Trenton, the biggest name to keep an eye on is RB Montrez Jackson who ran all over Frostproof last week in a 50-14 win. 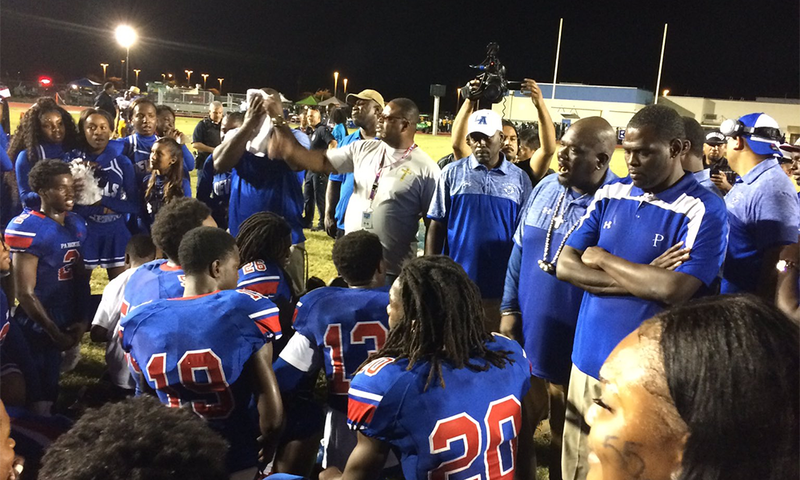 At Pahokee keep a big eye on QB Tyrone Smith who can throw the ball nicely and do so last week against 35-34 overtime win against Newberry in their playoff opener.